Ninety-five years ago, a very special baby girl was born in Seoul. 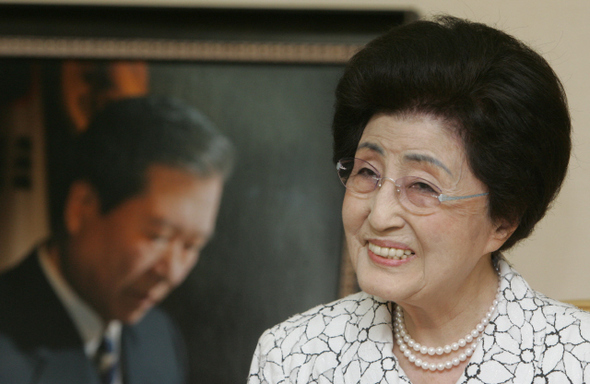 Growing up in Japanese-occupied Korea, she would go on to be a history-making first lady and a frontier-shattering pioneer for the rights of both children and women in her patria. In 1962, she would marry Kim Dae-jung, a political dissident who, in 1998, would become the president of Korea for five years. Now, the life story of Kim Dae-jung, who won the Nobel Peace Prize in the year 2000 for his famous “Sunshine Policy” instituting open dialogue and political relations with North Korea, is a fascinating one. Kim, a populist and talented orator, dubbed “the Nelson Mandela of Asia,” won the presidency on his fourth bid to do so. Prior to that, “Kim was tortured, imprisoned, kidnapped, sentenced to death, exiled, and regularly held under house arrest,” not to mention “surviving several assassination attempts.” This is truly the life story of a hero who literally put his life on the line for his love of democracy, equality, and country. His legacy is memorialized through the Kim Dae-jung Presidential Library and Museum (at Yonsei University in Seoul) and the Kim Dae-jung Peace Center. The subject of our cover story this month, however, is not Kim Dae-jung, but rather his extraordinary wife, First Lady Lee Hui-ho. Although I was unable to meet with her in person during her time here in Gwangju attending the World Human Rights Cities forum, she graciously accepted our request to grant a written interview. Below, you will find the text of my original email to her along with her written responses, as translated by the folks credited above. This was a real team effort, and I am confident very little content was lost in translation. I have decided not to edit the text at all, and just let the words speak for themselves. I hope you enjoy. ※ 이 기사는 광주뉴스에서 진행한 인터뷰로 영어로만 제공됩니다. Copyright 세계인권도시포럼 All rights reserved.